The output power of the transmitter. The sensitivity of the receiver. Physical obstacles in the transmission path. current way the persons hold their devices, objects in-between. Like all communication technologies, Bluetooth is a better fit for some applications than other. If you're considering to use Bluetooth, there are some basic things that are really good to know! Here’s an outline of the primary factors that determine the effective range of Bluetooth communications, plus some ways to improve it with networking. Bluetooth was originally designed to exchange a lot of data at close range in continuous, streaming data applications. The devices are able to both send and receive data at the same time. This is perfect for many common consumer products, such as computer headsets, where the two devices are close together. When Bluetooth low energy (BLE, formerly called Bluetooth Smart) hit the market in 2011, the key advantage over earlier versions was lower power consumption over the same range, but with lower bandwidth. It’s intended for devices that only need to exchange small amounts of data periodically, extending battery life by months or even years. While the radio performance and antennas are pretty static for a given Bluetooth device, the surroundings can vary a lot. Outdoors, in an open field, you can get a range of up to a hundred meters. But that is a rare situation. Indoors, obstacles like concrete walls will attenuate the radio signal and the effective range will be drastically reduced. In normal use, ten meters is a good guide to what can be achieved between two Bluetooth devices indoors. When developing a Bluetooth device, you can give your device a better range by selecting the Bluetooth chip with the best receiver sensitivity and output power, and making sure that you use a good antenna. Sometimes you may need to use Bluetooth over hundreds or thousands of meters. In the next section we will discuss how to extend Bluetooth range using networks. You can connect Bluetooth devices to multiple distributed gateways connected to the internet. The Bluetooth devices can communicate with each other, and with online services, via these gateways. This is an ideal solution if the devices are spread over a large geographical area. Each hub can usually only handle a few directly connected devices, which is another limitation of Bluetooth. You are likely to run into a situation where you want to handle hundreds or even thousands of Bluetooth devices in a relatively small area, such as an office building. For this you need to use a Mesh Network to connect the gateway and the local Bluetooth devices. The power of mesh networks. http://blog.nordicsemi.com/hs-fs/hubfs/Blog_pics/Tech_Explained/2016_06/mesh-network-internet.jpg?t=1507310355706&width=320&name=mesh-network-internet.jpg 320w, http://blog.nordicsemi.com/hs-fs/hubfs/Blog_pics/Tech_Explained/2016_06/mesh-network-internet.jpg?t=1507310355706&width=480&name=mesh-network-internet.jpg 480w, http://blog.nordicsemi.com/hs-fs/hubfs/Blog_pics/Tech_Explained/2016_06/mesh-network-internet.jpg?t=1507310355706&width=640&name=mesh-network-internet.jpg 640w, http://blog.nordicsemi.com/hs-fs/hubfs/Blog_pics/Tech_Explained/2016_06/mesh-network-internet.jpg?t=1507310355706&width=800&name=mesh-network-internet.jpg 800w, http://blog.nordicsemi.com/hs-fs/hubfs/Blog_pics/Tech_Explained/2016_06/mesh-network-internet.jpg?t=1507310355706&width=960&name=mesh-network-internet.jpg 960w" sizes="(max-width: 320px) 100vw, 320px" style="max-width: 100%; border: 0px none; vertical-align: bottom; height: auto; margin: 0px 0px 10px 10px; width: 320px; float: right;">The number of devices that require low-power operation and communication with other devices - and online services - is growing daily. In order to support this, BLE introduced support for Mesh Networks. 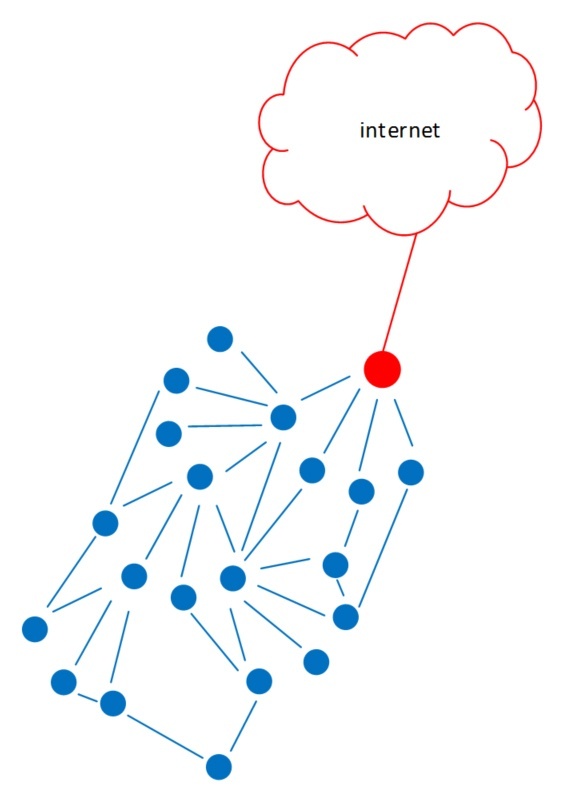 A Mesh Network allows you to connect a large number of Bluetooth devices over a wider area. In this situation, all devices, or “nodes”, in the same mesh are able to communicate with each other, either directly or via one or more intermediate nodes, as long as each node is close enough to at least two others. This way, the network does not depend on a central gateway to pass all traffic. Just like the Internet, data packets can find the most efficient route via any nodes between the sender and the receiver. 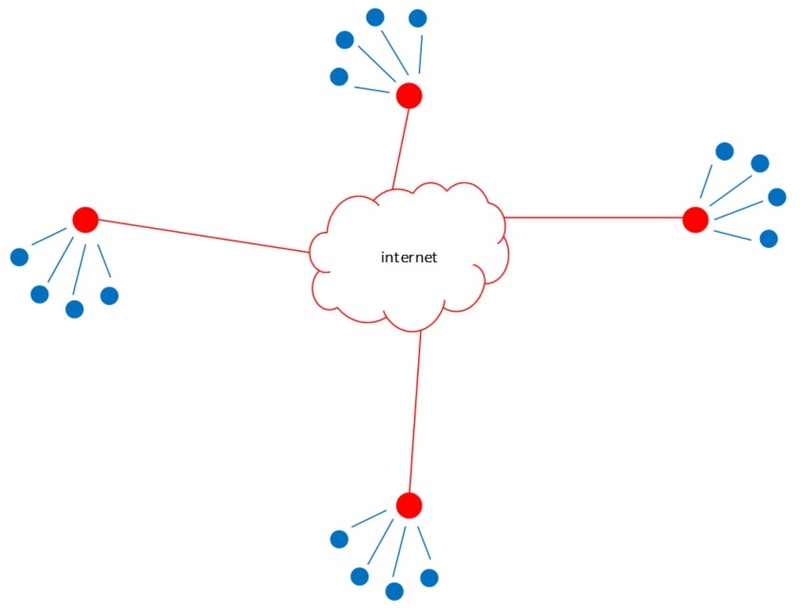 In a Mesh Network you can also use a “broadcasting” approach, where all nodes within the Mesh Network receive the same message, and then interpret it and take appropriate action. One example could be a smart lighting system. Each switch or bulb is a node on a Mesh Network using Bluetooth low energy. Each bulb is configured to know which room it’s in. The message is broadcast from Node 1, a light switch, via the mesh. The connected light bulbs in Room 1 receive this message, but they will not act upon it, as they know they are not in Room 2. The message is passed along and when it reaches the bulbs in Room 2, they turn on. Room 2 could be hundreds of meters away from Room 1, but will still receive the message via the other nodes in between. This way there could be a thousand or more rooms, all with lighting controlled from anywhere, using a Bluetooth low energy network.